Apple cider vinegar is the result of the acetic fermentation of apple juice. The fermentation is a two-step process: in the first step, bacteria and yeast convert the sugars in the juice into alcohol; in the second step, acetic-acid forming bacteria convert the alcohol into vinegar. Apple cider vinegar is mostly water and acids, such as acetic acid, malic acid, citric acid and oxalic acid. It also contains some minerals (calcium, iron, magnesium, phosphorus, potassium, sodium, zinc) and may contain some of the nutrients that can be found in apple juice, such as vitamins C and B6. 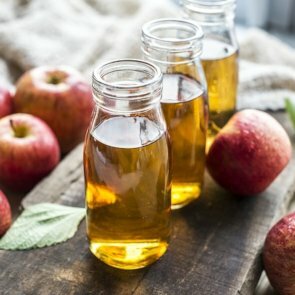 How Does an Apple Cider Vinegar Hair Rinse Work? The hair shaft consists of three layers, starting from the inside: the medulla, the cortex and the cuticle. The cuticle is the outermost part of the hair shaft consisting of flat, thin dead cells, overlapping in layers like roof shingles. Normally, the cuticle lies flat, making your hair look smooth and shiny. However, when you wash your hair, shampoo lifts the cuticle scales to remove the dirt and build-up from your hair. If you don’t smooth them back down, you hair may get dry, rough, and frizzy. Apple cider vinegar has an acidic pH, just like your hair and scalp. As a result, it balances the scalp and smooths down the cuticle, making your hair smooth, soft, shiny, and more manageable. They make the hair soft, smooth and shiny. They tame the frizz, prevent tangling and make the hair more manageable. They help restore and maintain the healthy pH balance of your hair and scalp. They have antimicrobial properties and therefore inhibit the growth of bacteria and fungi that cause dandruff and some other scalp and hair problems, such as itchiness and minor infections. They remove the residual build-up that may have been left after shampooing. They clarify the scalp and unclog hair follicles, which may reduce hair loss and boost hair growth. Undiluted vinegar is too acidic to use on hair, so it’s important to mix it with water before applying. Generally, it is advised to mix equal amounts of water and vinegar. If you have oily hair, you can add an extra tablespoon of vinegar to balance it. If you have dry hair, add slightly more water. If your hair is curly, color-treated or permed, you need to use a much more diluted solution. You may need to experiment to find a dilution that works best for your hair. To make your rinse even more effective, you can add dried or fresh herbs to it. Some of the most useful herbs include rosemary, sage, lavender, chamomile, marigold, lavender, thyme, witch hazel, verbena, linden, nettle, horsetail, hibiscus, and peppermint. To make a herb-infused vinegar rinse, place herbs in a glass container, add vinegar, cover the container with an airtight lid and put the mixture in a cool, dry place for a couple of weeks. After two weeks, strain the herbs and dilute your infused vinegar with water. How to use a vinegar rinse? First, you need to shampoo your hair as normal. You can skip the conditioner because the rinse already has a conditioning effect. Slowly pour the rinse into your hair, massage it into your scalp and spread it from roots to tips. Let the rinse sit for five to ten minutes, then rinse your hair with cool and lukewarm water. Don’t worry if your hair still smells like vinegar after you’ve rinsed it; the smell will be gone once once it dries. Let the hair dry naturally or use a hair dryer. To keep your hair soft and shiny, use the rinse once or twice a week to remove build-up and restore shine. You should keep in mind that too much vinegar can dry out your hair, so don’t use the rinse too often. Another thing that you need to remember is that vinegar stings the eyes, so be careful.